May has been a busy month for Husband Walter and me. Saturday May 3 was a beautiful day with comfortably cool temperatures, just right for a quick day trip to New Orleans. 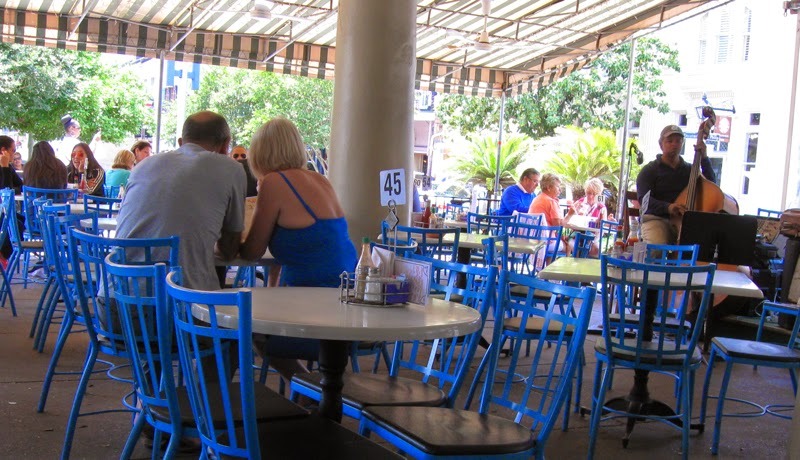 We enjoyed lunch, music and people watching in a French Quarter café. A short walk up Decatur Street and we arrived at Café du Monde for a dessert of beignets. Hubby’s interest decreases as heat and humidity increase. That means we probably won’t be visiting NOLA again until about October or November. He posted his take on our jaunt here. Sunday, May 4 my spouse surprised me with an afternoon outing to nearby Pass Christian to join the Pass Christian Historical Society’s tour of homes fundraiser. Five of the homes featured on the tour were open to the public. Three of those five were located on Scenic Drive. Whenever we travel west anywhere near Pass Christian, Husband Walter knows I want to take Scenic Drive. The street veers off U.S. 90 to a higher elevation that parallels the beachfront highway. 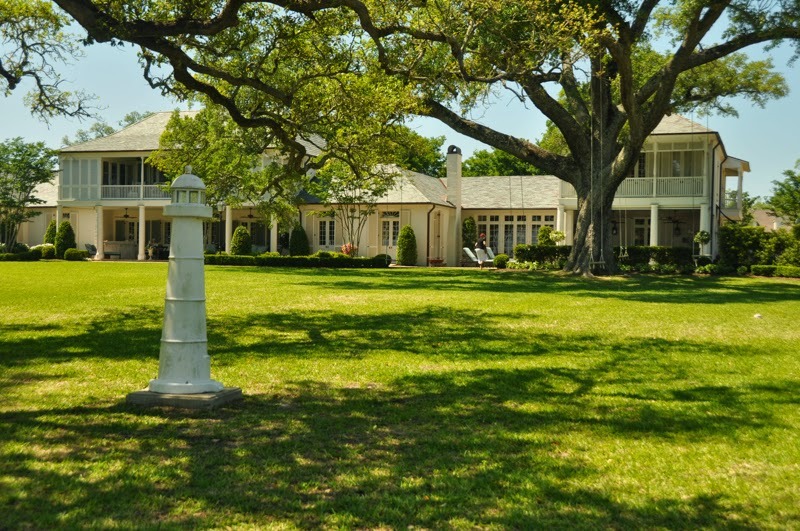 The drive offers views of historic homes, ancient live oaks and gardens. Some of the homes destroyed by Hurricane Katrina have been rebuilt. Others that withstood the force of winds and storm surge with varying degrees of damage have been restored. Vacant lots are reminders that after almost nine years, recovery and healing are far from complete. We managed to make it to each of the five open houses with lots of walking. With Hubby as my safety officer, I even made it up and down stairs in two of the three homes with second floors open to the public. My surprise was a treat indeed as well as excellent therapy for this stroke survivor. Husband Walter posted more about the tour of historic homes here. Wow, what a treat! But the best thing is that you went up and down the steps!! Kudos to you for traversing the stairs. Best therapy with your loving hubby. Summer in NOLA is not my choice. The humidity is almost unbearable to me. Have worked many times at the convention center. AC was divine but walking out the door almost knocked me over. Good to be out and about. I did not realize you were so close to NOLA you could make a day trip. Heat gets to me too. Two art exhibits here in town..10 minutes away. We'll see if I make the effort. I've grown lazy, I fear. Also hubby has difficulty walking and won't use motorized chair the museum has on site. Stubborn man. I'm with your hubby on the heat and humidity thing. It's pretty brutal. I talked to a New Orleans resident last month while we were there celebrating my husband's birthday. He said that certain areas of NO look like Katrina just hit it. Not much recovery at all. So sad. Anyhow, I'll bet the tour of homes was fun! I did that once in Dallas. Amazing how people let you just traipse through their homes. I too hate the heat which is why I live on the west coast literally. So glad to read both your entries, and wonderful to see you here again.